My friend Jason has a huge yard in Pacific beach. I talked him into letting me garden over there. 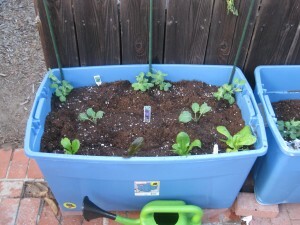 We created raised beds from plastic storage containers that I found on craigslist. The soil in San Diego is terrible so this was an easy way to get a garden started at his house. His yard is shaded so we decided to use this little section of patio space. We had to drill holes in the bottom of the plastic storage containers before we added the dirt and planted. In this first bin, we planted peas, broccoli, and romaine. I wanted to put up some string for the peas to climb, but didn’t have the string or the time… Jason’s roommate wanted the romaine because he eats salads quite often. 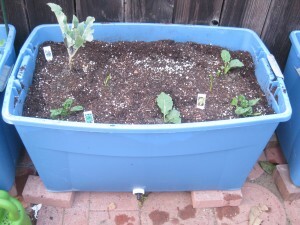 The second bin has a couple spinach plants, onions, garlic, and purple cauliflower. 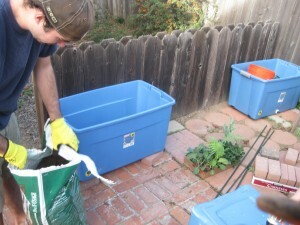 We placed some paver bricks underneath the bins so that there is good drainage. Since this was the first year that I grew winter crops, this is definitely an expieriment with the spacing. I haven’t been over to his house for a while and I’m curious to see how cramped things are in the bin. 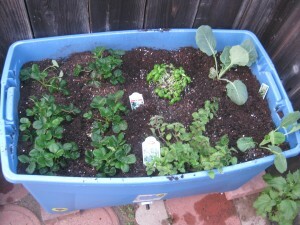 In the third bin, we planted strawberries, basil, oregano, and two brussel sprout plants. It might have been too cold to plant the basil here at this time, again I don’t know how it’s done. We planted this in November and I will post an update once I get over there to see how things are progressing. 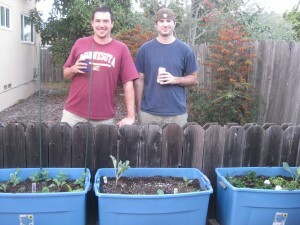 Here is a picture of Jason and I after we planted everything. 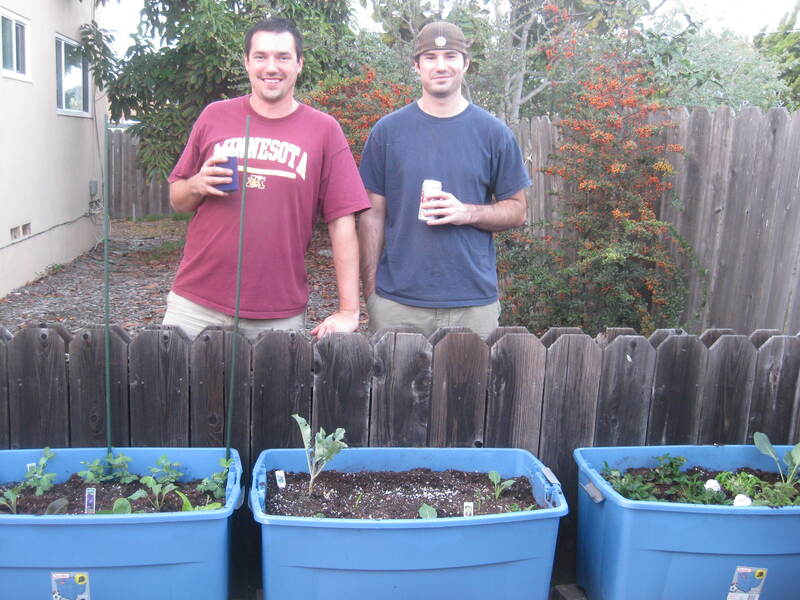 It was a nice Saturday afternoon and since Kelly was driving, I was able to have a few beers with Jason after we completed planting. I will go take some pictures this weekend and post them to the site. Can’t wait to see how everything is doing! This entry was posted in Jason's Raised Bed Garden by lars1273. Bookmark the permalink.